Through multiple, short-lived, thematic shows, Heavy Rotation aims to provide an adrenaline rush of shifting contexts, fresh curatorial perspectives, and highly varied technologies. The show’s fluid structure also asks us to imagine an exhibition as a series of changing visual events, rather than a static installation. In Heavy Rotation‘s roster, one grouping includes artists who harness specific elements from nature (including rocks, water, snow, and a snail) as imagery while simultaneously foregrounding a handful of unique approaches to “process” in the act of art making. Love and interpersonal relationships inform another show, which explores romantic communications, desires, and miscommunications via a variety of platforms and situations, including Chat Roulette, Craigslist singles ads, and public display of affection. A third installation maps psychological and sociological landscapes that engage the viewer in privately-informed, off-kilter narratives situated in culturally specific, mentally imaginative, and geographically peripheral environments. Finally, New York-based curator Anthony Thornton rounds out the schedule with a selection of videos that explore the public inevitability of private performance within our increasingly connected world. Participating artists: Bobby Chirila, Petra Cortright, Tim Davis, Keith Edmier, Lindsey Eskind, Don Evans, Jesse Fleming, T. Foley, Alexa Gerrity, Matteo Giordano, Ilana Halperin, Seth Kelly, Noriko Koshida, Karsten Krejcarek, Camille Laurelli, David O’Reilly, Ariana Page Russel, John Pilson, Cheryl Pope, Joshua Seidner, Rbt. Sps., Brent Stewart, and Grant Worth. Naturally / February 24 – 29 / Keith Edmier, Jesse Fleming, Ilana Halperin, Seth Kelly, Cheryl Pope and Brent Stewart. 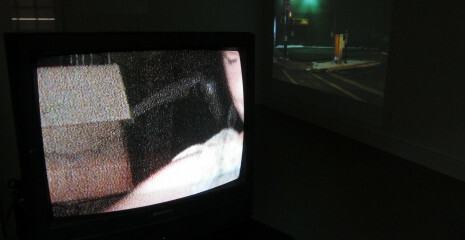 Let’s Talk About Love / March 1 – 4 / Lindsey Eskind, T. Foley, Noriko Koshida, David O’Reilly, John Pilson, Joshua Seidner. Bobby Chirila, Petra Cortright, Tim Davis, Keith Edmier, Lindsey Eskind, Don Evans, Jesse Fleming, T. Foley, Alexa Gerrity, Matteo Giordano, Ilana Halperin, Seth Kelly, Noriko Koshida, Karsten Krejcarek, Camille Laurelli, David O’Reilly, Ariana Page Russel, John Pilson, Cheryl Pope, Joshua Seidner, Rbt. Sps., Brent Stewart, and Grant Worth.